Roatan, Bay Islands, Honduras. United States Freediving Association (USFA) is pleased to announce that Nick Mevoli of Brooklyn, NY set a new United States Men’s Freediving National Record in the Constant Weight discipline, swimming with just one breath of air down to a depth of 100 meters (328 feet) with a monofin. 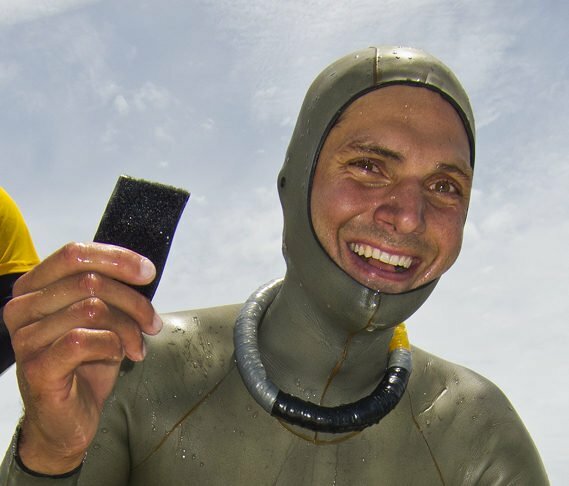 His performance took place during the inaugural international freediving competition, The Caribbean Cup hosted by Esteban Darhanpe of Argentina. Nick tied the previous Constant Weight national record Saturday, May 25 to a depth of 96 meters (315 feet). The record was held by the International Association for the Development of Apnea (AIDA) Vice-President and veteran freediver, Rob King who held all the male American depth records. After a day of rest Sunday Nick came back even stronger to seal his place in the record books today at 100 meters. Nick Mevoli sporting a smile and the tag, retrieved from 100.6 meters. The record setting, 100.6 meter dive took two minutes and forty five seconds to complete. His ascent and surface protocol were strong. When asked about the dive Nick commented, “God is great! I thought a lot today about my Grandfather and how he must have been in the stands watching me. There were a lot of positive vibes coming from the spectators on the catamaran. I tried a new equalization technique today and I guess it worked. Now, back to the pool to train for Serbia.